Advancing age puts many Americans at risk of oral health conditions, including root decay, gum disease and tooth loss. Yet Medicare does not include coverage for dental health care in the standard benefits for older adults. Oral Health America (OHA) wants change that. In 2016, OHA tasked Marketing for Change with developing a strategy for consumer outreach and partner buy-in. A deep dive into existing research – looking at older adults’ perspectives of dental insurance and oral health; their life priorities and concerns; and the complicated process and competitive landscape of Medicare enrollment – revealed that ultimately people don’t really care about insurance, especially dental insurance; what they care about is their teeth and their vitality. An argument focused on the financial and health importance of insuring their teeth would be unlikely to be heard. Instead, we decided to make the case that by excluding dental coverage from Medicare, the government was making a judgment about what it means to be on Medicare. 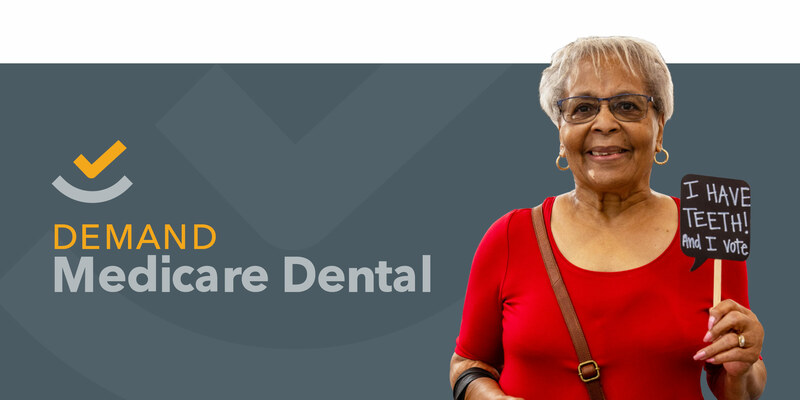 Translation: “The government doesn’t think Medicare needs to include dental coverage because Medicare means you’re old and old people wear dentures.” If we wanted a message and a framework to engage the disengaged, we needed to give them something to yell about. Armed with this insight, we began developing draft creative designed to resonate with the values and needs states of older adults. We then tested these messages with a series of intercept interviews with our target audience. The IDIs prompted further refinements, and we are currently planning a national survey to test our approach. Our research will wrap up this summer, so it is still too early for results. Our next steps are to present our findings the research results at an upcoming symposium led by OHA to discuss this policy initiative.